HDD Drill Pipe Manufacturers DITCH WITCH – www.ditchwitch.com Pipe/Machine Pipe OD Wall Thickness Drill Pipe Length Bend Radius Max Torque (ft./lbs.) Power Pipe – Unlined JT60 3.06″ 0.35″ 15′ 170′ 9,000 JT20, JT2020 2.06″ 0.24″ 10′ .. In the United States, an irrigation district is a cooperative, self-governing public corporation set up as a subdivision of the state government, with definite geographic boundaries, organized and having taxing power to obtain and distribute water for irrigation of lands within the district. It is c..
by Michael Reed, Contributing Editor Direct Pipe is a single-pass process Laney Directional Drilling, which last year used Direct Pipe technology to make an underground pipeline crossing through wetlands in the Northeast feasible, explained the process to attendees at a symposium on Oct. 14 in Hou..
Our industry is filled with talented professionals who share a passion that drives the industry forward. 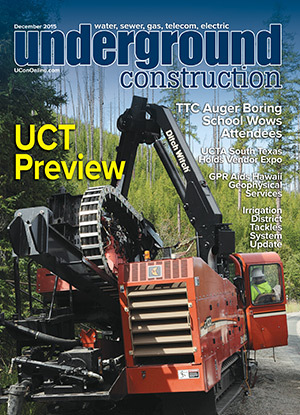 Take the opportunity to network with these professionals at the Underground Construction Technology International Conference & Exhibition (UCT) in Atlanta, Feb. 1-4, 2016. Known for its business-.. The theme of the Underground Construction Technology Association (UCTA) South Texas Chapter luncheon on Oct. 9 was Innovative Technology. Thirteen vendors presented information to an audience of over 80 owners, contractors and consultants with information on modern technologies including composite m.. Earn CEUs/PDHs at UCT by attending the UCT primary education program as well as seminars and workshops hosted by industry partners, Monday, Feb. 1 through Tuesday, Feb. 2. These programs will be held at the Westin Peachtree Plaza Hotel. Advance registration is necessary as seating is limited. Take ..
UCT is pleased to welcome Jo Ann Macrina, Commissioner of the Department of Watershed Management for the City of Atlanta, as the speaker for our 2016 keynote session. Appointed by Mayor Kasim Reed in April 2011, Macrina is committed to providing quality drinking water; protecting and improving Atlan..
Powered by an 81-hp CAT turbo diesel engine, the Ring-O-Matic 550 vacuum excavator features a 1,000-cfm blower and delivers 27-gpm at 2,700-psi up to 400-ft. with its 3/4-inch jetter hose. The trailer’s axels are rated to 16,000-lbs., allowing the 550-gallon spoils tank and 500-gallon freshwater tan..
Ditch Witch SK752 Mini Skid Steer Ditch Witch’s new mini skid steer SK752 expands the company’s line of compact equipment with improved features adding confidence, productivity and versatility on the job. Powered by a 24.8-hp Kubota diesel engine, the machine exerts impressive power for all machin.. The CX210D excavator from CASE provide operational gains including a 12 percent faster cycle time, improved responsiveness and multifunctional control, and up to 14 percent greater fuel efficiency. CASE also increased breakout force on the CX210 excavator by as much as 6 percent. Weighing in at 48,.. The Toro RT600 riding trencher is built to deliver smooth, consistent performance in tough digging conditions. The RT600 is the only trencher in its class using a flywheel, torsion shaft and planetary gear reduction system. The flywheel minimizes trencher stalls, the torsion shaft absorbs shock load.. Rain for Rent introduces SiteMax line of portable trash pumps by PowerPrime Pumps into their rental fleet. These patent pending pumps, capable of pumping up to 3,000 gallons per minute and 3-inch solids, feature standard sound attenuation, and are ideal for many pumping applications. The ultra-porta..
Lockwood, Andrews and Newnam, Inc. In response to the firm’s growth in the Infrastructure Large Diameter and Transportation Business Groups, Lockwood, Andrews and Newnam (LAN) has promoted two employees to head the charge. Warren Green, P.E., (pictured top left) was promoted to vice president and .. Underground Construction Business News In order to continue growth of Atlas Copco’s consumables, parts and service business, the company announced Jamie Roush as its new vice president/business line manager, Construction Service Division. Roush has more than 17 years of industry experience to his ..
House passage of an oil export bill for the first time in 40 years puts pressure on the Senate to follow suit. The House bill (H.R. 702) is narrowly focused on the oil export issue. However, the Senate bill (S. 2011), awaiting action on the Senate floor, is broader and encompasses provisions on oil .. The Distribution Contractors Association (DCA) is forming a multi-industry alliance to recognize and assess problems in relation to workforce capacity challenges faced by the energy construction sector, where instability is expected to strain the financial resources, leadership and personnel within .. Despite more than $2 billion in federal and state funding over the past 50 years to provide for essentials such as running water, residents in at least 30 secluded Alaskan villages live without basic plumbing infrastructure. With the State of Alaska facing tightening budgets, traditional piped wate..
by Robert Carpenter, Editor-in-Chief As we wrap up 2015, one can’t help but reflect on a year that was, that could have been and that wasn’t. It was a year of international and national terror, though amazingly those horrific acts have seemed to have little lasting impacts upon the markets and thu..
Meticulous Prep, Planning Essential To Success A combination of thorough planning and field-tested experience is critical to achieving a high level of construction success. This was the case in American Samoa when Michels Communications was given about 18 months to build a robust fiber optic networ..